(The Root) — We caught up with Florida Rep. Allen West at a luncheon for African-American Republicans, organized by young black conservative Stephen Lackey and co-hosted by John Daniels Jr., a black Harvard Law School classmate of Gov. Mitt Romney. West has drawn fire for once alleging that President Obama wanted Americans to "be his slave," for using the words "get the hell out" during remarks aimed at the president and Democrats, for speculating that as many as 80 Democratic members of Congress are practicing communists and for labeling a Democratic congresswoman "vile" before encouraging her to "shut the heck up." After dismissing his upcoming election opponent as a "chump" at the luncheon, West weighed in on liberal racism, why some Americans should fear him and whether his own party should fear his rhetoric. The Root: When you hear about what happened to the black CNN camerawoman who had nuts thrown at her and people shouting something about "feed the animals," how do you respond to that? That happened here at the GOP convention. 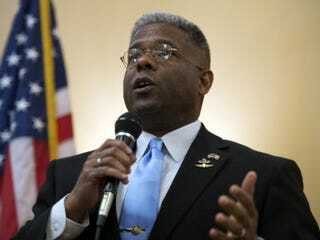 Rep. Allen West: How do you respond to people calling me an Uncle Tom or sellout? The Root: How do you respond? What do you think of it? What do you think when people call you an Uncle Tom? AW: I don't give a dad-gum because it doesn't bother me. I don't understand what happened last night. I wasn't there, so I'm not going to comment, but all this hypocrisy that comes from the other side — they need to check themselves. AW: You don't understand what I mean by the hypocrisy? The hypocrisy of how they treat black conservatives like Condi Rice and Colin Powell, myself — anyone. Look at that insane letter the Congressional Black Caucus wrote about Artur Davis, calling him a Judas and a traitor. He can't think for himself? This is appalling; it's sad. The Root: To be fair, I've actually never heard Condoleezza Rice and Colin Powell called names, and I've heard plenty of black Americans say positive things about them. Do you think people like you are perceived as more extreme, so that's why you face more criticism than a Condoleezza Rice or Colin Powell? AW: Extreme because of what? The Root: I'm asking if you think people perceive you as extreme. AW: I don't care if they perceive me as extreme! If they think the Constitution is extreme — do they think serving 22 years in [the] military is extreme? Having a family? Wanting to have a balanced budget is extreme? Wanting to have the right type of tax and regulatory policy and access to capital so small business can grow? Wanting to have a strong national defense is that extreme? Believing in family? Believing in our culture? Believing in protecting our borders? Believing in individual sovereignty? That's not extreme. The extremists are on the other side. Because all they want to do is have more people wedded to government programs, and that's how they have control. I want to unleash the entrepreneurial spirit of this country. That's not extreme. AW: I haven't put my foot in my mouth. The Root: You don't think there are conservatives who are nervous you are going to say the wrong thing? AW: Then why are conservatives always looking up to me and I'm always getting on shows and I continue to speak? Once again, you're trying to brand me as something, and I don't know where this is coming from. The Root: You've never heard anyone call you controversial? AW: What's controversial about me? People only call you controversial when they are afraid. The Root: Do people have a reason to fear you? AW: People who want to do our country harm. The Root: If a young black voter is listening, can you give him or her one reason to vote Republican?